With "Teen Titans GO! to the Movies" now in theaters, writer Tim Beedle offers up his five reasons for people who don't watch the show to see it. And yes, one of them is Michael Bolton. Put down those pitchforks, DC fans. (I mean, unless you’re reading this while shoveling hay or something.) I know you’ve gotten used to seeing exciting, live-action DC movies hit theaters each year and so far, the closest we’ve gotten to that in 2018 were some blink-and-you’ll-miss-‘em Ready Player One cameos. And I know that an animated comedy just isn’t the same thing, no matter how many Deathstroke battles we try to cram into it. But as my mother keeps trying to convince me, change is good. Change is part of life. Change is a lot like those Flintstones vitamins we had as kids—it’s good for us, and in this case, also just happens to feature colorful cartoon characters. You should go see the movie. Seriously, stop waving that pitchfork around! You might lose an eye or accidentally knock down a ceiling light, and more important, you won’t be able to read my five reasons you should give this movie a shot. There are more Easter eggs in this than in any other comic book movie you’ve ever seen! While it may not have quite as many geeky cameos as the aforementioned Ready Player One, Teen Titans GO! to the Movies comes in a close second. Even better, they’re all DC-related! The DC characters who make an appearance easily number in the high dozens, and that doesn’t even include the heroes who don’t appear onscreen directly, but are mentioned in conversation or show up on posters or ads in the background. Plus, there are surprise trips to familiar settings, references to other superhero movies, a billion in-jokes, some surprising guest stars and just other overall geeky goodness. Seriously, it’s too much to catch in one sitting and far, far more than we’ve ever seen on the show. Even more, fans like you are likely the only ones who are going to get those jokes. For most of the people out there—you know, the ones who don’t realize that Nicholas Cage almost played Superman in the nineties—those jokes are just going to go right over their heads. And they’re such good jokes. You don’t want that to happen to them, do you? It gives us Deathstroke on the big screen! Look, I realize this isn’t exactly the Deathstroke the last DC movie suggested we’d be seeing, but it is technically Deathstroke…even if he’s never called that. Instead, he’s referred to simply as “Slade,” which believe you me is for the best. You’re going to be glad no one ever refers to him as Deathstroke in this. You’re also going to be glad that he’s voiced by Will Arnett because the guy knows a thing or two about bringing humor to typically dark characters. He also proves to be a far savvier villain than you’d expect, making a pretty sharp statement on the way we consume entertainment in the midst of his villainous plot. But he also manages to defeat the Titans with lame party tricks, so it’s not all biting satire and commentary. This Deathstroke has quite a few weapons in his figurative arsenal. And in his literal one. It IS Deathstroke we’re talking about after all. Those poop jokes are pretty brilliant! Yes, I know, we adults are supposed to have outgrown poop jokes, but let’s be real. You never really outgrow poop jokes, you just get more discriminating about them. The mere mention of pooping no longer does it for us the same way it might have when we were 8 years old, when simply hearing the word said out loud seemed to be the funniest thing to ever happen to us. But if Batman were to straight-faced mention pooping in the Batmobile or something, you’d still laugh. Well, that doesn’t happen in Teen Titans GO! to the Movies. (There are plenty of Batmobile jokes and plenty of poop jokes, but sadly, never the twain do meet.) But the bathroom jokes that you do get are even better. In fact, don’t be surprised if they wind up being some of your favorite moments of the film. After all, while everyone loves a good superhero action scene and everyone may love the Teen Titans, what have you experienced more in life? Fighting crime as a half-demon, cyborg or alien warrior princess…or having a moment unexpectedly interrupted by a loud, embarrassing fart? As much as you may wish it’s the former, you know it’s not. Just like you know you weren’t the one who actually farted. Nope! Definitely not you!! It’ll be the movie that makes you a Michael Bolton fan! I’m guessing you probably don’t spend a lot of time listening to Michael Bolton. In fact, you probably haven’t thought of the guy since around the mid-1990s. Well, he’s still around, and as Teen Titans GO! to the Movies makes clear, seems to be having some fun at this point in his career. He’s recorded a song with the Teen Titans Go! cast for the movie called “Upbeat Inspirational Song About Life,” which is pure, synth-laden, ’80s-influenced, unapologetically cheesy soft pop bliss that you likely won’t be able to get out of your head. Only, that’s okay because the song grows on you the more you hear it, and the fact that it’s sung in Bolton’s distinctively earthy voice gives it just the right amount of seriousness to balance the whole thing out. Or maybe it’ll make you want to shove popcorn in your ears until it’s over and you’re able to queue up some mumble rock or death metal on your Spotify to regain your musical dignity. Either way, are you telling me you’re not the least bit curious to hear it? If nothing else, the mid-credits scene will make it worth it for you. I know DC movies have been somewhat hit and miss when it comes to stuff after the credits, but do you really think that Teen Titans GO! to the Movies is going to resist having some fun with one of the most beloved superhero movie tropes? There’s both a mid- and post-credits scene in this movie, but it’s the mid-credits one that you’re going to be all about. Trust me on this one. 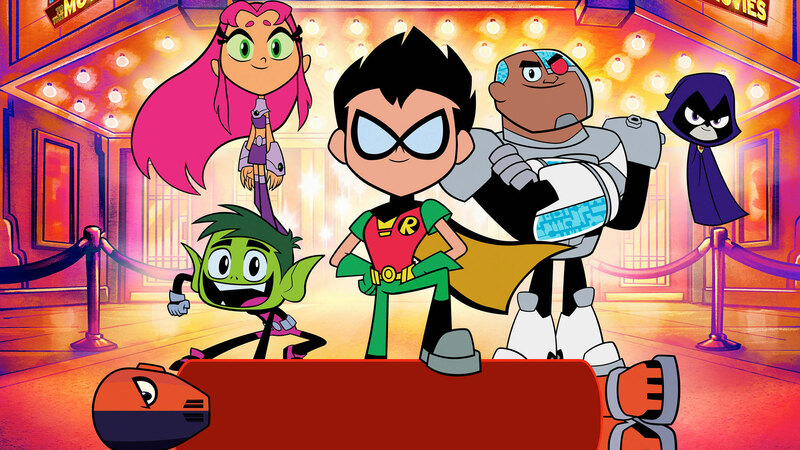 So, yes, you should go see Teen Titans GO! to the Movies, even if you’re not a fan of the show. If you’re a fan of DC heroes and villains, or of geeky, occasionally crass humor, or of simply of sitting in air-conditioned rooms for around 90 minutes (and who doesn’t love that? ), you’re not going to be disappointed. And if you are, well, I’m sure you’ll let me know all about it in the comments below. Tim Beedle is the Content Editor for DCComics.com and writes about comics, TV, movies and pretty much everything DC touches. You can find him on Twitter at @Tim_Beedle.